Exporting a PDF document to image allows you to save the contents of the source PDF document as a collection of imaghge files that can be opened in third-party applications. Adjust the exporting settings and click the Export button to save PDF as images. File Name – specify a file name for images or browse for the destination image. 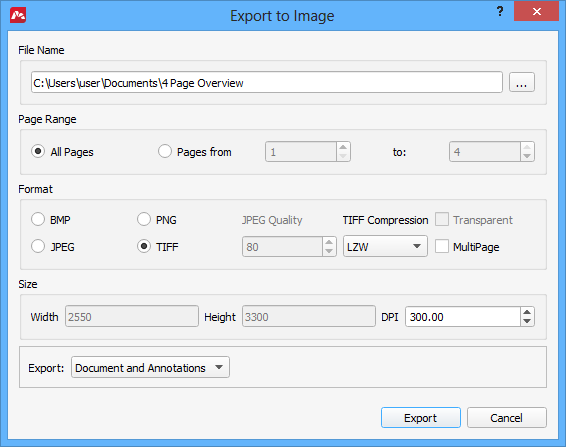 If multipage exporting is selected (see below), an incremental suffix will be added to the specified file name upon exporting: DocumentName_1.png, DocumentName_2.png,… etc. Page Range – choose what pages of the document you want to export to images. Format – select the destination image format: BMP, JPEG, PNG or TIFF. JPEG Quality is only available if the JPEG format is selected. This option specifies the quality of the JPEG-compressed images. The recommended value of 80 is a good compromise between quality and size of images. LZW – is a legacy lossless compression algorithm that works best with 8-bit sources. ZIP – also delivers lossless compression which is slightly slower and slightly better than LZW. CCITT FAX 3 – is a lossless compression method for black-and-white images. It works best for texts, so if your PDF is mostly text, choose this format. In the FAX 3 (or Group 3) modification the algorithm encodes each scan line of the text independently. CCITT FAX 4 – the same as above, but each scan line is encoded with reference to the previous line yielding better compression ratios. JPEG – is a lossy compression algorithm (see above). Transparent – this option is only eligible if PNG is selected as the output format. The option makes the background of images transparent. MultiPage – if enabled, the source PDF document is saved as one image with multiple pages inside. This is only available for TIFF. Size – here you can adjust the DPI of the output image. The dimensions of the image are calculated automatically. Export – choose if you want to export the document with annotations or the document only.